In the early days of internet the bulletin boards were rife with debate and conversation. Interactions were meaningful and the discussions had validity. After the latest trend of social websites these kinds of discussions have all but vanished. Today the conversations are littered with memes, funny pictures, viral videos, and trolling responses. Moot is a radically different discussion platform, unencumbered by the weight of unnecessary features and distractions. It places the conversation back to the forefront. Clean user interface, persistent content and deep integration into the site will allow a more natural and meaningful discussion to take place. People will focus on topics they care about. 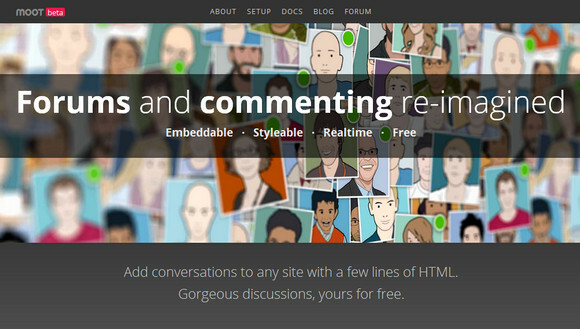 You can add conversations to any site with a few lines of HTML. Gorgeous discussions, yours for free. Ouch, busted! :) We had a brief downtime earlier today, but that’s resolved now.